19th Century vocal repertoire for Bass (20 pieces). Includes pieces by Berlioz,Bizet,Debussy,Gounod,Masse,Massenet,Meyerbeer,Saint-Saens, Thomas, and Verdi. 19th Century vocal repertoire for Bass (20 pieces). Includes pieces by Berlioz,Bizet,Debussy,Gounod,Masse,Massenet,Meyerbeer,Saint-Saens, Thomas, and Verdi.. Edited by Roger Nichols. 85A. Photoprint edition - publisher prints this title after order is received. Classical Period and Impressionistic. Collection. With vocal melody, lyrics, piano accompaniment and introductory text. 115 pages. 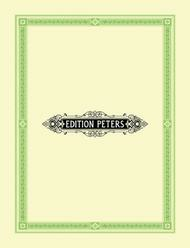 Edition Peters #EP7556. Published by Edition Peters (PE.EP7556). Includes critical commentary, English & German translation for each piece and guidance on pronunciation. Careful edition and notes. All are critical editions. 20 of 46 people found this review helpful.